Someone at 2K is certainly saying, "Yes!" Don't ever doubt the power of the WWE universe, especially when you give them a good free-to-play game. 2K Games has announced that its mobile trading card game WWE SuperCard has been downloaded over 1.5 million times on both iOS and Android platforms, making it one of the company's most successful mobile launches to date. On top of that, 82 million victories have been achieved in the game's exhibition mode, and over 575,000 King of the Ring tournaments have taken place since the game's launch. Over 18 million unique play sessions have been recorded, averaging about 14 minutes in length. Not bad for a game that's only been out for approximately ten days. If you haven't checked it out yet, you can download it over at iOS and Android. It's free-to-play with the option to buy premium cards and other items through in-app purchases. Totally optional, though. Robert Workman posted a new article, WWE SuperCard hits record 1.5 million downloads. I cannot believe people are actually playing that. Jeff's description made me 8I the entire time I was listening. it's fun but i wish the systems were a little more transparent. I can only grind so long on that rare level! so I should play this while waiting for my Alloy Vault and Headquarter upgrades to finish? i don't know what those are, but yes. I'ts so fast paced and it lets the numbers get bigger! The speed of the thing is what hooks me. I GET TO UNCOVER NEW CARDS! 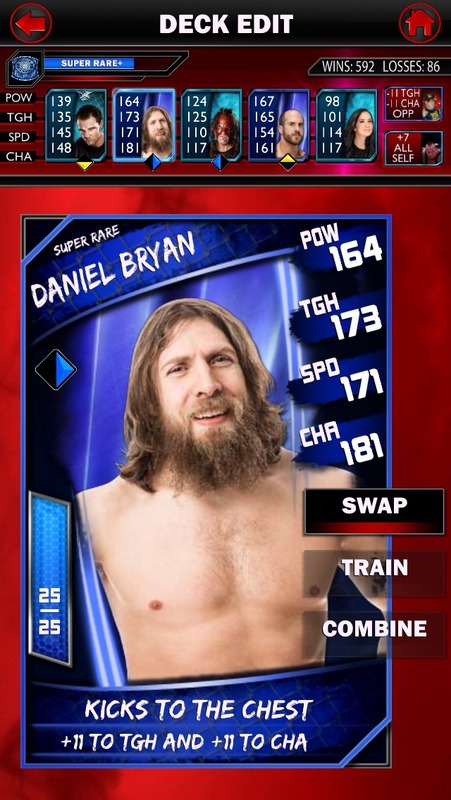 I have a Pro Rare Dean Ambrose and a Super Rare Daniel Bryan and Cesaro. I wish there was a larger variety of cards though. You have this huge roster and past stars, but it's mostly the same 10-12 cards. I've seen an Orange card and a Purple card and they were just juggernauts. I don't know how long you have to grind for those, but these guys had like 20-3 records so I guess they dumped like $50 on this, which is MADNESS.